You can also check out RouteFlow's website and video presentation for more information. You can download the newest RouteFlow distribution from our GitHub repository. Further instructions for installing and running RouteFlow are provided in the README file. It's very easy to install on Ubuntu 12.04! 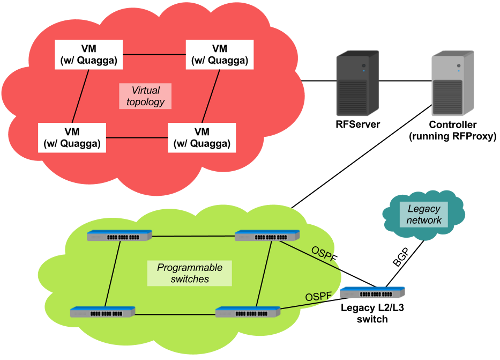 Open-Source framework to support the different flavours of network virtualization (e.g., logical routers, router aggregation / multiplexation).